I was saddened to learn of the passing of Sir Clifford Darling this morning. 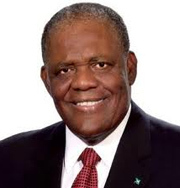 Sir Clifford, the fourth Bahamian Governor-General of an independent Bahamas is a hero of the labour movement and for the rights and dignity of workers. On behalf of the Government and people of The Bahamas I extend heartfelt condolences to Igrid, Lady Darling, to Sir Clifford’s children: Clifford Darling Jr., Andrea Darling-Thompson, Sharlene Hanna, Theresa McPhee, Rushena Darling, Lakreisha Darling and Charles Darling, and to his extended family, and many friends. Sir Clifford’s passing brings to a close another remarkable career of an early nation builder and pioneer for equality. A son of Acklins Island, Sir Clifford was shaped and formed by conditions prevailing on that far flung island in the early decades of the last century. He attended public schools in Acklins and then in New Providence. His entry into public life was driven by his strong desire to secure equity for fellow disadvantaged taxi-drivers. He became Secretary General of the Taxicab Union in 1949 and held the post until 1957. He subsequently was elected President of the Union becoming a central figure in the 1958 General Strike. The success he helped win for taxi drivers set the stage for dramatic political change in our country; a change that began in 1967. A lifelong member of the Progressive Liberal Party, Sir Clifford first entered Parliament as a Senator in 1964 and was elected to the House of Assembly in 1967 representing the historic constituency of Englerston. Two years later in 1969 he was appointed to the Cabinet. As Minister of Labour and National Insurance he oversaw the introduction of the National Insurance programme in 1974. Sir Clifford was elected Speaker of the House of Assembly in 1977, a post he held until 1991. On January 2nd 1992 he was appointed Governor General, serving as head of state until January 2nd 1995. He was knighted by Her Majesty the Queen in 1977. In 1994 during a visit to The Bahamas, Her Majesty made Sir Clifford a Member of the Grand Commander of the Victorian Order (GCVO). Bahamians owe a debt of gratitude to Sir Clifford for his half a century of public service marked by honesty, industry, loyalty and integrity. His proud legacy will not be forgotten. Even as we mourn his passage, we celebrate his life of service and dedication to The Bahamas. May he rest in peace.